This post of a comic by Howie Post is purely nostalgic for me. 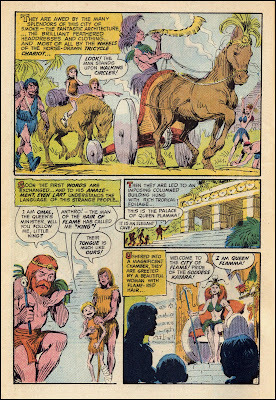 I bought this comic off the spinner in the winter of '68, weighing in just at the tail end of the Silver Age, according to the reckoning of some, just before the demise of the 12 centers. 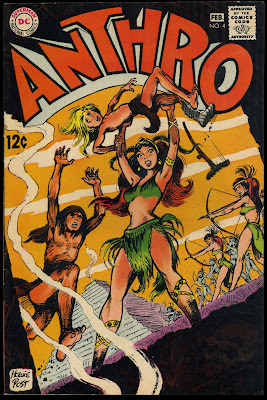 Anthro was edited by Joe Orlando, who also edited some of the other non-mainstream titles (I'm only guessing here, so don't yell at me if I'm wrong—maybe BatLash, Angel and the Ape, the DC mystery titles?). Anyway Carmine Infantino was the DC editorial director at the time, and all the titles at that time seemed fun and enticing to read. I've gotten rid of most of those comix over time, but for some reason I kept this one. 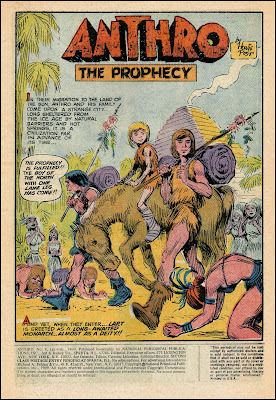 Howie Post had a style that some would not enjoy, being anything but Kirby, but to me seemed refreshing. Around that time he was also a newspaper cartoonist, drawing The Dropouts, of which I will show some samples soon. What We Have Here . . . When Up Came a Blackbird . . .
J. C. Does J. C.